Description: 32 count Summer Khaki Belfast linen by Zweigart from Norden Crafts with Sampler Threads from The Gentle Art and Weeks Dye Works. Frame by East Side Mouldings. 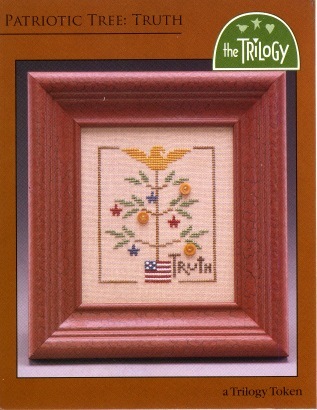 Circle Star Trinket (TR309) available through The Trilogy. Design can be stitched either over two linen threads or over one linen thread. Description: 32 count Light Mocha Belfast linen by Zweigart from Norden Crafts with Weeks Dye Works and Sampler Threads from The Gentle Art. Gold Swirl buttons by The Trilogy. Frame by East Side Mouldings. Description: 32 count Natural Belfast linen by Zweigart from Norden Crafts with Sampler Threads from The Gentle Art and Weeks Dye Works. Bone Trinket by The Trilogy. Frame by East Side Mouldings. 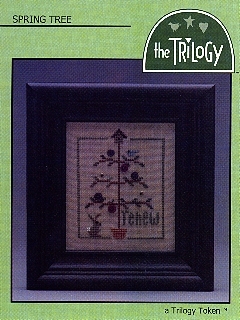 Design can be stitched either over two linen threads or over one linen thread. Description: 32 count Country French Latte linen from Wichelt Imports with Weeks Dye Works and Sampler Threads from The Gentle Art. Birds O' Plenty buttons by The Trilogy. Frame by East Side Mouldings. Description: 32 count Clay Belfast linen by Zweigart from Norden Crafts with Sampler Threads from The Gentle Art and Weeks Dye Works. Stitches include eyelet. Buttons by Just Another Button Company. Finishing by Sew It Seams. Description: 32 count Natural Belfast linen by Zweigart from Norden Crafts with Weeks Dye Works and Sampler Threads from The Gentle Art. Frame by East Side Mouldings. Design can be stitched either over two linen threads or over one linen thread. Description: 32 count Summer Khaki Belfast linen by Zweigart from Norden Crafts with Sampler Threads from The Gentle Art and Weeks Dye Works. Stitches include zigzag, herringbone, pattern darning, tied oblong, rhodes, four-sided and eyelet. Buttons by Just Another Button Company. 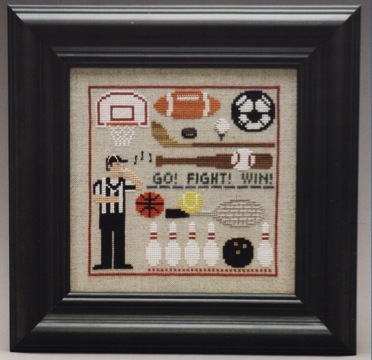 Framing and mats by Bowman's Framing, Ft. Thomas, KY. Description: 32 count Summer Khaki Belfast linen by Zweigart from Norden Crafts with Weeks Dye Works and Sampler Threads from The Gentle Art. 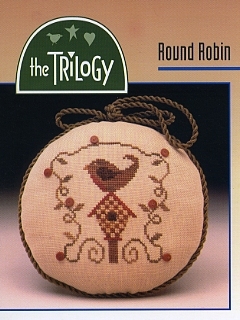 Bird, Circle Star and Checkered Heart Trinkets by The Trilogy. 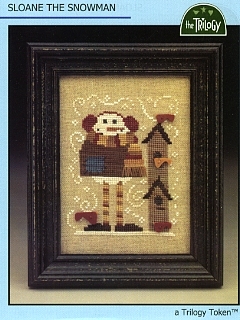 Stitches include herringbone, four-sided, fence, rhodes, scotch, smyrna, rhodes, over one and long armed cross. Alphabet and number charts included for personalizing. Frame by East Side Mouldings. Description: 32 count Dirty Belfast linen by Zweigart from Norden Crafts with Weeks Dye Works, Sampler Threads from The Gentle Art, and Crescent Colours. Meadow Flower Buttons by The Trilogy. Frame by East Side Mouldings. Description: 32 count Natural Belfast linen by Zweigart from Norden Crafts with Weeks Dye Works and Sampler Threads from The Gentle Art. Birds O' Plenty buttons by The Trilogy. Frame by East Side Mouldings. Description: 32 count Summer Khaki Belfast linen by Zweigart from Norden Crafts with Sampler Threads from The Gentle Art, Weeks Dye Works, and Crescent Colours. 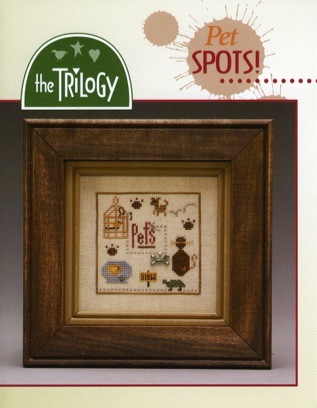 Autumn Sneak Peek Trinkets are by The Trilogy. Frame by East Side Mouldings. Design can be stitched either over two linen threads or over one linen thread. 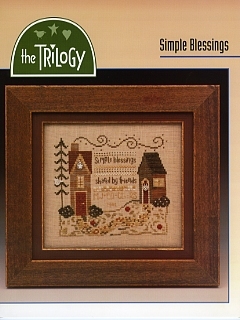 This design is available in 3 charts: Sneak Peek Autumn: Border and the Little Leaf Girl (TR1218), Sneak Peek Autumn: Scarecrow and the Turkey (TR1219), and Sneak Peek Autumn: Kitty and the Crows (TR1220). Description: 32 count Summer Khaki Belfast linen by Zweigart from Norden Crafts with Sampler Threads from The Gentle Art, Weeks Dye Works, and Crescent Colours. 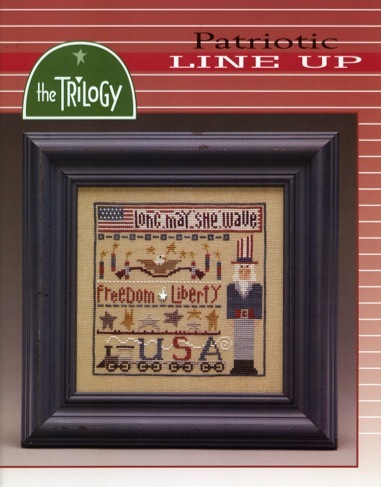 Christmas Sneak Peek Trinkets are by The Trilogy. Frame by East Side Mouldings. Design can be stitched either over two linen threads or over one linen thread. 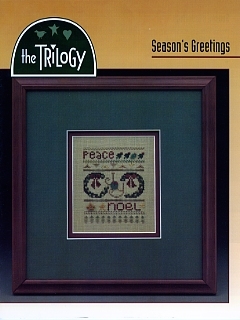 This design is available in 3 charts: Sneak Peek Christmas: Border and Stocking (TR199), Sneak Peek Christmas: Reindeer and the Angel (TR1203), and Sneak Peek Christmas: Star Tree and the Elf (TR1204). Description: 32 count Dirty Belfast linen by Zweigart from Norden Crafts with Sampler Threads from The Gentle Art and Weeks Dye Works. Halloween Sneak Peek Trinkets are by The Trilogy. Frame by East Side Mouldings. Design can be stitched either over two linen threads or over one linen thread. 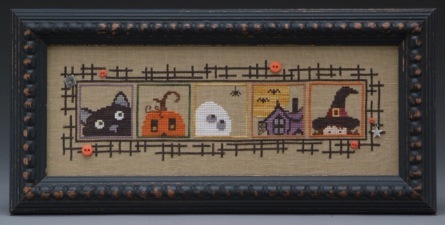 This design is available in 3 charts: Sneak Peek Halloween: Border and Cat (TR195), Sneak Peek Halloween: Jack and the Ghost (TR196), and Sneak Peek Halloween: Haunted House and the Little Witch (TR197). Description: 32 count Rue Green Belfast linen by Zweigart from Norden Crafts with Sampler Threads from The Gentle Art, Weeks Dye Works, Crescent Colours, and DMC. 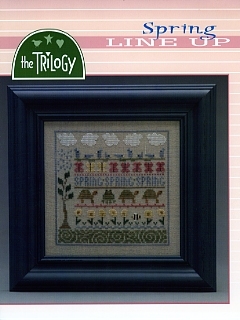 Spring Sneak Peek Trinkets are by The Trilogy. Frame by East Side Mouldings. Design can be stitched either over two linen threads or over one linen thread. 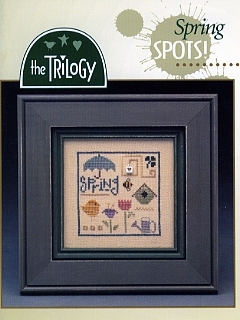 This design is available in 3 charts: Sneak Peek Spring: Border and Umbrella Girl (TR1207), Sneak Peek Spring: Bees and Flowers (TR1208), and Sneak Peek Spring: Gnome and Kitty (TR12109). Description: 32 count Rue Green Belfast linen by Zweigart from Norden Crafts with Sampler Threads from The Gentle Art, Weeks Dye Works, and Crescent Colours. 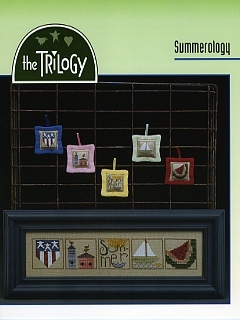 Summer Sneak Peek Trinkets are by The Trilogy. Frame by East Side Mouldings. Design can be stitched either over two linen threads or over one linen thread. This design is available in 3 charts: Sneak Peek Summer: Border and the Dog (TR1211), Sneak Peek Summer: The Chef and Picnic Goodies (TR1212), and Sneak Peek Summer: The Diver and Ice Cream Stack Up (TR1213 ). Description: 32 count Dirty Belfast linen by Zweigart from Norden Crafts with Sampler Threads from The Gentle Art, Weeks Dye Works, and Crescent Colours. Winter Sneak Peek Trinkets are by The Trilogy. Frame by East Side Mouldings. Design can be stitched either over two linen threads or over one linen thread. This design is available in 3 charts: Sneak Peek Winter: Border and the Bear (TR1225), Sneak Peek Winter: Snowy Fun and Folly (TR1226), and Sneak Peek Winter: Snowballs and Snowed In (TR1227). 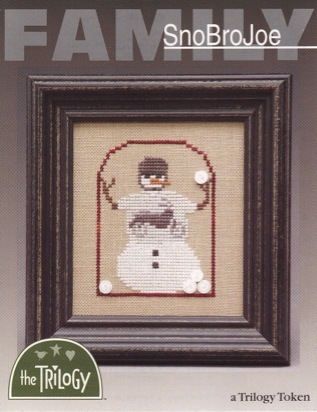 Correction: Sneak Peek Winter Snowy Fun and Folly (TR1226) - There is a + symbol in the design that should be an = symbol and stitched in Whitewash on the snowman. Description: 32 count Dirty Belfast linen by Zweigart from Norden Crafts with Weeks Dye Works, and Sampler Threads from The Gentle Art. 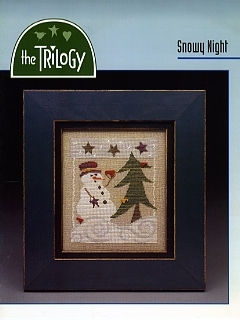 Snowball Buttons by The Trilogy. Frame by East Side Mouldings. Description: 32 count Natural Belfast linen by Zweigart from Norden Crafts with hand-dyed floss from Weeks Dye Works, The Gentle Art, and Crescent Colours. 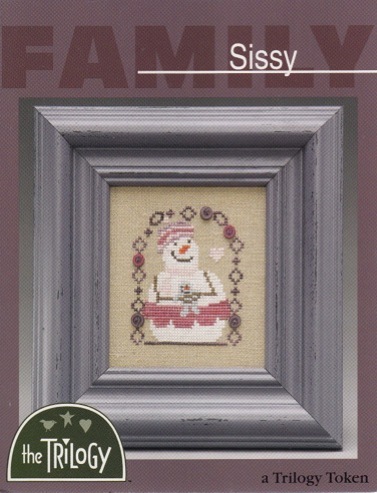 Snowflake trinket included with the chart. Frame by East Side Mouldings. Description: 32 count Natural Belfast linen by Zweigart from Norden Crafts with Weeks Dye Works and Sampler Threads from The Gentle Art. Birds O' Plenty buttons by The Trilogy. Stitches include smyrna. Frame by East Side Mouldings. Design can be stitched either over two linen threads or over one linen thread. Description: 32 count Natural Belfast linen by Zweigart from Norden Crafts with Sampler Threads from The Gentle Art, Weeks Dye Works, and Crescent Colours. Frame by East Side Mouldings. Design can be stitched either over two linen threads or over one linen thread. Description: 32 count Natural Belfast linen by Zweigart from Norden Crafts with Weeks Dye Works and Sampler Threads from The Gentle Art. Birds O' Plenty buttons by The Trilogy. Frame by East Side Mouldings. 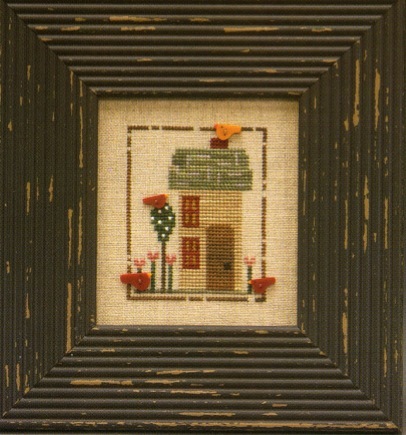 All four seasonal houses (Winter, Spring, Summer and Autumn) can be stitched together! Description: 32 count Summer Khaki Belfast linen by Zweigart from Norden Crafts with Sampler Threads from The Gentle Art and Weeks Dye Works. 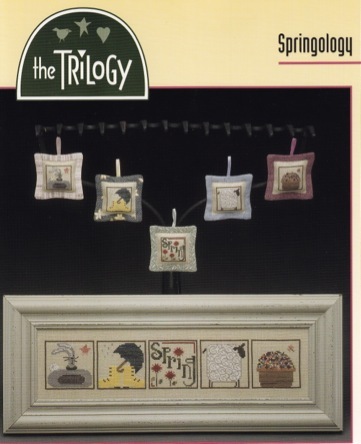 Square Heart Trinket by The Trilogy. Frame by East Side Mouldings. Description: 32 count Summer Khaki Belfast linen by Zweigart from Norden Crafts with Weeks Dye Works and Sampler Threads from The Gentle Art. Meadow Flower buttons by The Trilogy. Frame by East Side Mouldings. Description: 32 count Summer Khaki Belfast linen by Zweigart from Norden Crafts with Sampler Threads from The Gentle Art and Weeks Dye Works. Frame by East Side Mouldings. 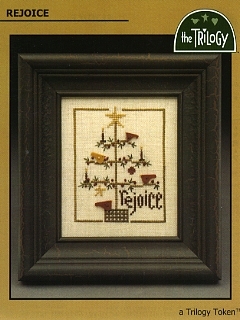 Ornament finishing by Sew It Seams. Design can be stitched either over two linen threads or over one linen thread. Description: 32 count Natural Belfast linen by Zweigart from Norden Crafts with Weeks Dye Works and Sampler Threads from The Gentle Art. Meadow Flower buttons by The Trilogy. Frame by East Side Mouldings. 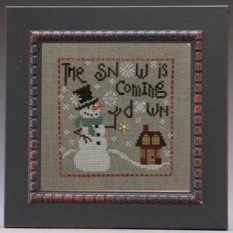 All four seasonal houses (Winter, Spring, Summer and Autumn) can be stitched together! Description: 32 count Summer Khaki Belfast linen by Zweigart from Norden Crafts with Sampler Threads from The Gentle Art and Weeks Dye Works. 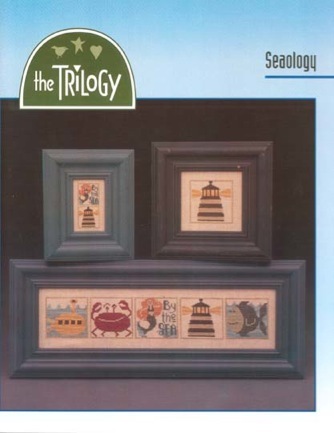 Bird Trinket by The Trilogy. Frame by East Side Mouldings. 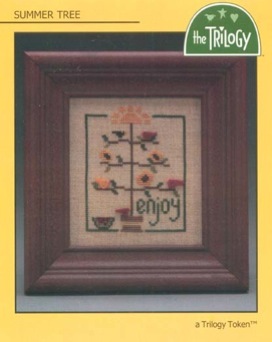 Design can be stitched either over two linen threads or over one linen thread.